Originally a medicinal beverage brought from ancient China by Buddhist monks, tea (cha) was both rare and expensive in Japan for many centuries. The first tea seeds were planted in Japan during China's T'ang dynasty (618-905), and cultivation of the plants was associated with temple life and religious activity. Today, more than a thousand years later, tea has become Japan's national beverage. 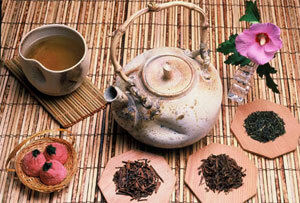 From the Zen Buddhist tea ceremony, to the daily three o'clock tea break, drinking tea is a Japanese institution. Both stimulating and relaxing, Japanese teas such as tangy sencha, smoky hojicha, and earthy kukicha refresh the palate and heighten the pleasure of eating all types of food. Although all Japanese tea comes from the evergreen Camellia sinensis, unique processing produces teas with different tastes, colors, and physiological effects. Like many herbal brews, Japanese tea has legendary health benefits, some now scientifically proven.